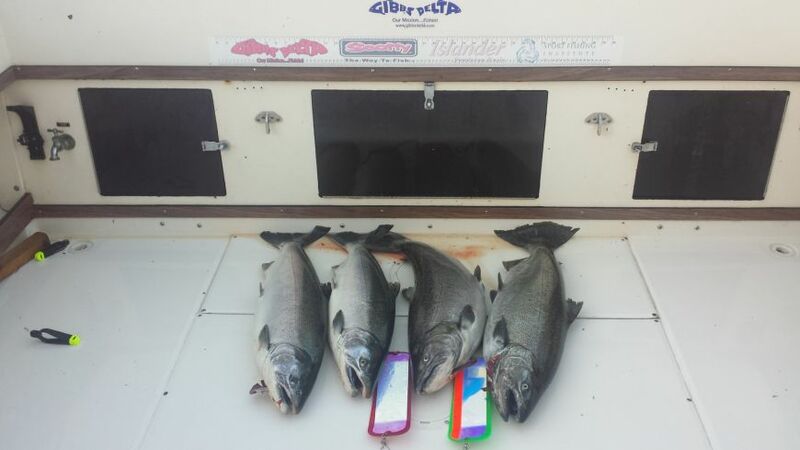 The last two weeks have been decent in our local fishery, yes there were some tough days, but there was quite a few very good days with some BIG chinook and some BIG hatchery coho caught. As we move into October, we will see the last of our migratory chinook enter local waters and we should see an increase in coho and chum salmon numbers. 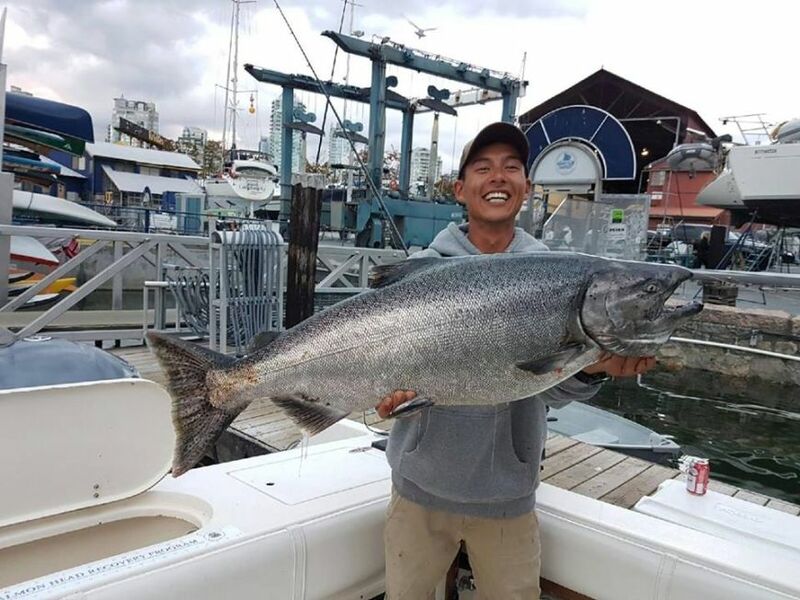 We are pretty optimistic that we will see some good fishing for big coho and even chum salmon in off the Fraser River Mouth until late October. 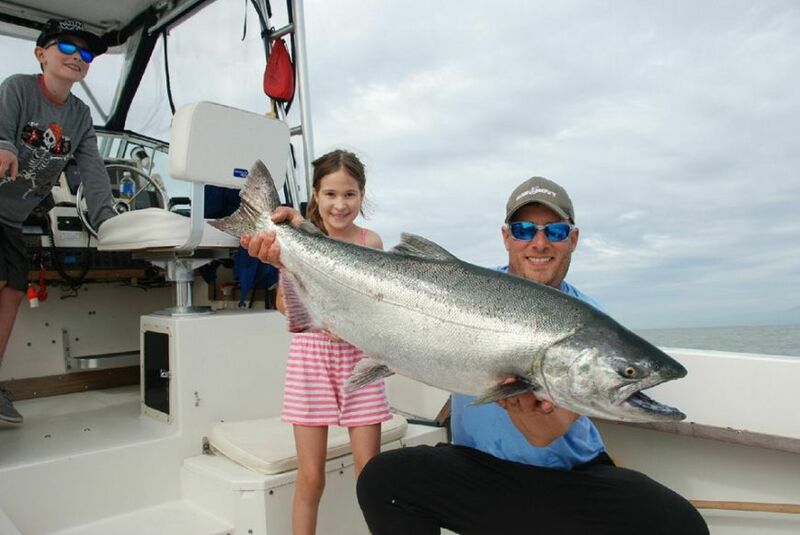 The white chinook came in right on schedule this month, with some good pulses to the Cap Mouth and the Fraser Mouth. 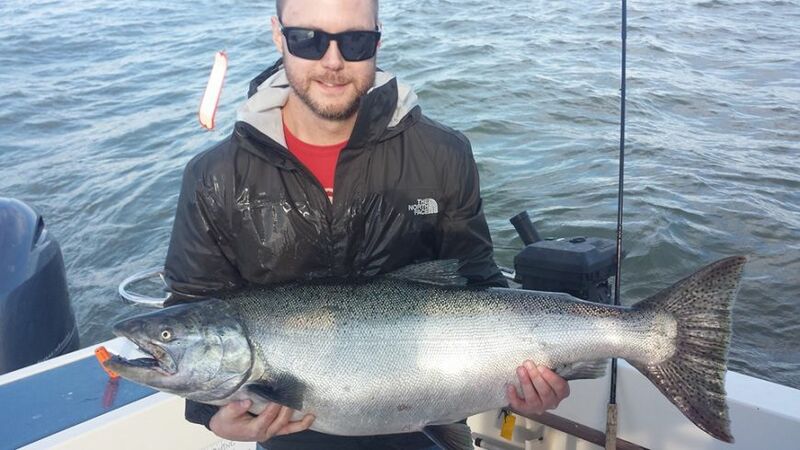 There was confirmed reports of fish up to 45 pounds landed off the Fraser Mouth. Our boats did not get anything that big, but we did land 30 plus pound fish off the Fraser and 20 plus pound fish of the Mouth of the Capilano and West Van shoreline. As we move into October we will start to spend more and more time off the Fraser River Mouth targeting coho, chum and the odd late running chinook salmon. With the strong numbers of coho elsewhere in Georgia Straight we are anticipating and hoping that we will have a good coho fishery starting in the next week or two. Typically the fishery gets good in early October and lasts until late October. Last year we had some productive fishing for coho and chum until the 26th of October. These later run fish are most effectively targeted by running anchovies in teaser heads behind flashers. We have been having our best success running Rhys Davis teaser heads in glow/chartreuse/green combinations. Our favourite Gibbs Delta Guide Series Flashers have been working well as usual. We have been running the Gibbs Delta purple "Slurpee" Flasher and it has been working well on chinook and even chum salmon. Some days off the Fraser Mouth glow and white hootchies as well as smaller Silver Horde, G Force, and Skinny G spoons will do well on coho salmon. Our charter shop on Granville Island is open most days and has all the right gear and bait for our local fishery. We have had a couple nice feeder/winter chinook back to the dock in recent weeks and have also released a decent number of undersized feeders as well. We have also had encouraging reports from other areas in Georgia Strait that some nice feeder/winter chinook are already being caught. This bodes well for our winter chinook fishery which will start in November and really get going in December. Only time will tell, but we are hoping for a great winter fishery like last year. Give us a call if you want to head out on the water. 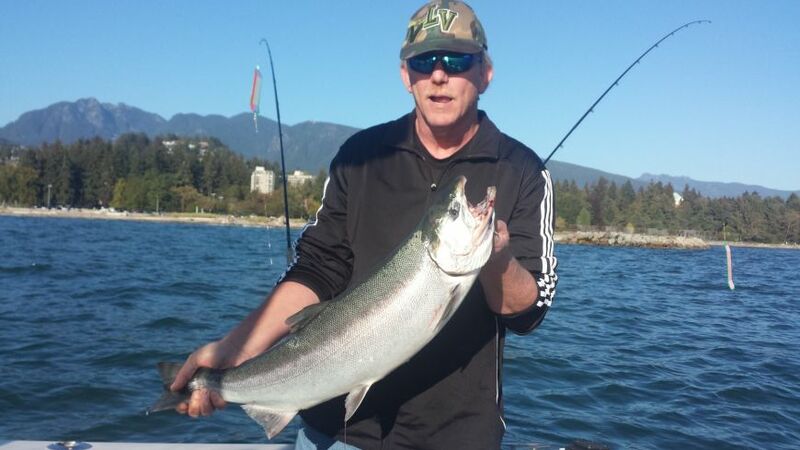 October should be a good month to do some longer 6 to 8 hour charters to the South Arm of the Fraser River. If you are looking for a short trip, a 5 hour trip to the Capilano Mouth is another good bet this time of year. We try and fish the rising tide off the Fraser River and the Capilano Mouth and we schedule our departure times according to the tides where possible.